A couple has spent the past year raising more than £5,000 for a childhood cancer charity - and there is one more challenge left to do. 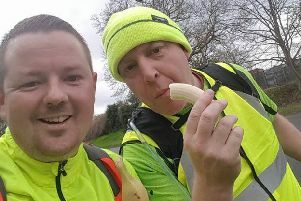 Paul Holt, of Ribchester, is preparing for the London Marathon as part of his mission to raise thousands for Childhood Eye Cancer Trust, which (CHECT) is a charity dedicated to helping people affected by retinoblastoma. So far, the 31-year-old has raised £3,500, with plenty of time for more sponsors to donate. Paul’s wife, Keri, has already raised £1,200 by hosting an event at her salon, Keri Michelle Nails and Beauty, in Longridge, and Paul took on the Tough Mudder last year, raising £1,300. Keri, 30, says: “It is important for us to raise awareness, as childhood cancers are not that well funded, so I want to help the cause and raise funds for Childhood Eye Cancer Trust. •Retinoblastoma is a rare type of eye cancer that can affect young children, usually under the age of five. It is marked by an unusual white reflection in the pupil – this may be apparent in photos; a squint; a change in the colour of the iris; a red or inflamed eye or poor vision.